Wexford Mental Health Association has had a very busy and successful 2018 in which we also celebrated our 40th Anniversary. To mark this huge milestone of the Association, we had a concert “You’ll Never Walk Alone” to mark the occasion. The Concert took place in St Iberius church and was packed to capacity. Local Artists from around County Wexford such as Yvonne Collier, Patricia Goggins, Mark Redmond, Stagefright, The Man Whom( Ian Doyle) County Wexford Youth Orchestra, Stephen Murphy, Jimi Cullen, Sweet Beats our own Community Group – Inner Harmony. Speeches on the night were given by Brenda who gave a very powerful speech on the impact that Wexford Mental Health Association has made on her life, from Fr Colm Murphy – Chairperson of Wexford Mental Health Association, From Catherine Brogan Development and Training Manager at Mental Health Ireland and from Wexfords Mayor Tony Dempsey. 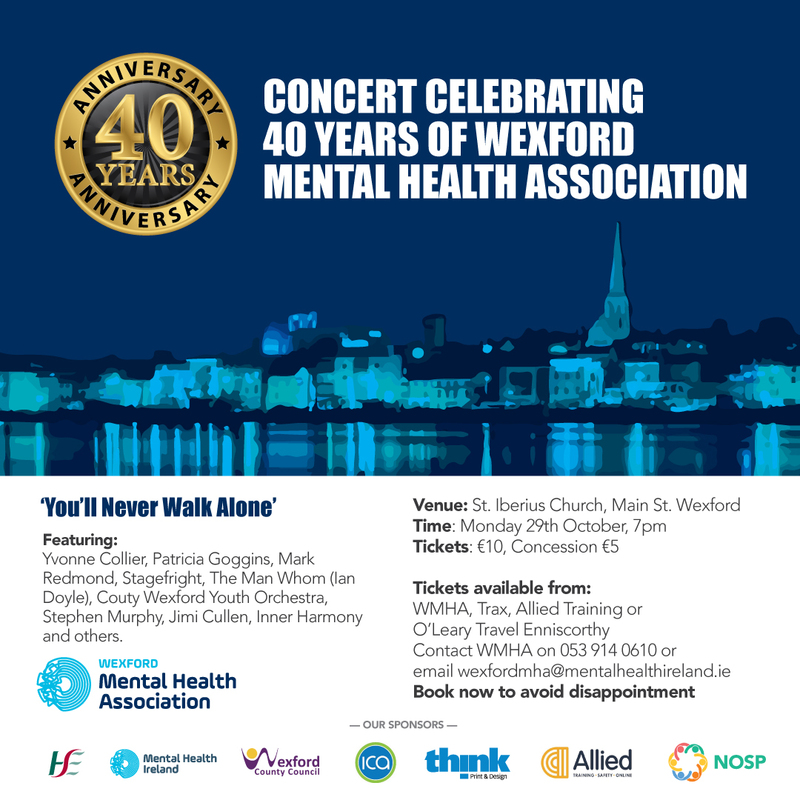 He was so impressed by what the night that he confirmed on the night that Wexford Mental Health Association will receive a Mayoral Reception to honour its 40th Anniversary. The night finished with a very powerful version of “you’ll never walk alone” by Patricia Goggins and all the groups involved in the night. A reception followed in our Training and Information Centre in Henrietta Street with the beautiful Artwork on display from our Creativity Counts Exhibition.